In proud and thankful memory of the men who / laid down their lives in the Great War 1914-1918. Greenham War Memorial – Dedication Service, 2 Oct 1921. The church of St Mary's, Greenham, is one of the most beautiful in the district, its interior being adorned with mural paintings of great taste. There has just been added a memorial which is harmoniously in keeping with the architectural embellishments, and is a worthy tribute to the men of Greenham who fell in the Great War. It is the generous gift of Mr Lloyd Henry Baxendale, of Greenham Lodge, and forms a handsome feature in the church. "In pround and thankful memory of the men who laid down their lives in the Great War, 1914-1918." The artist was Mr H Grylls, of the firm of Burlison ahd Grylls, and the alabaster work was carried out by Mr C G Hare, one of the finest modellers in the country. The Memorial was unveiled at a special service on Sunday afternoon, which was attended by a crowded congregation. The seating was superintended by the churchwardens, Messrs C Dalby and C F Paice, and accommodation was reserved for the relatives and friends of the fallen men. The service was conducted by the Vicar (Rev J N Blagden) and was of impressive character. Opening with the sentences of the Burial Service, the names of the men were read. The Psalms were "The Lord is my Shepherd." The hymns included "Jesus Lives," "On the Resurrection morning," and "O God our help." 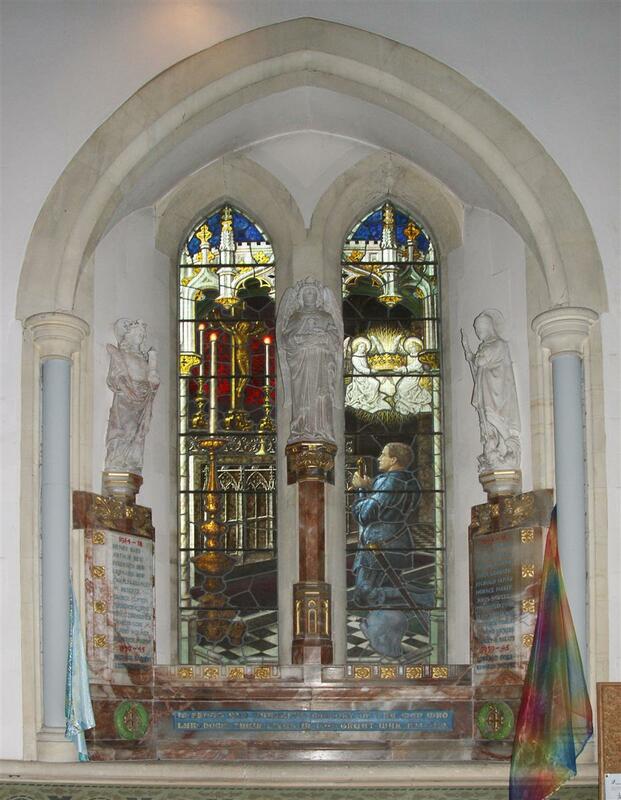 The window which had been covered with the Union Jack, was unveiled by Lieut-Colonel Elkington, DSO, who said - "I am a stranger to many of you, and as such I feel it a great honour to have been asked to unveil this window, which has been given by a well-known parishioner as a mark of respect and gratitude to the brave men of this parish who gave their lives for this country in the Great War. Now let us try to look on this window, not only as a memorial but as a guiding light and a beacon for the future. The men whom this window commemorates have set us a great example; let us endeavour to follow it as they would have wished. There are somewho think there are hard and difficult times before us; others who think the worst is passed; but whatever the future may bring, let us hope we may be able to be calm, think wisely, and act justly. Your dear ones have mande the supreme sacrifice, let it be an inspiration to all of us who remain to try to work together for the common good and make out country happy and prosperous. We learn by suffering, so let us ever remember the lesson of self-sacrifice these gallant men have taught us, that one day, perhaps, it may be said of us also, "Well done thou good and faithful servant." In conclusion I would appeal to you all, and through you to future generations, to guard well this window that it may remain for all time in this beautiful church as a Memorial, a mark of respect, and of very deep gratitude to those brave men of Greenham who laid down their lives for their King and Country. At the close of the service, the National Anthem was sung, followed by a bugler sounding the Last Post. The organist (Mr Russell Wade) played a funeral march, the congregation standing meanwhile. Among those present were Mr and Mrs Lloyd Baxendale, the latter attired in Red Cross unifrom, and wearing her war decorations.